Lots of people complain about the heat, but we really kind of enjoy it. And boy have these last few days sure been steamy! On days like these meal time requires simple, stay out of the kitchen recipes. That doesn't mean we're not cooking, it just means that we bring it outside. We fire up the charcoal grill and sip iced beverages while sitting under the maple tree that overhangs our patio. Last night's grilling dinner was even more special because much of the meal was homegrown - lettuce, cilantro, garlic scapes. Every summer I am reminded that nothing is better than fresh picked homegrown produce. We kept it nice and light. I just can't eat heavy in summer; I mean, the weather makes you sluggish enough. This meal met all the requirements - light, fresh and easy with barely any kitchen time. 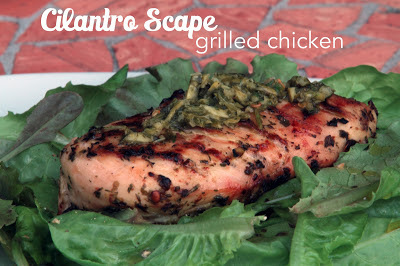 The cilantro scape marinade popped with freshness and was a perfect match for the smokiness of charcoal-grilled chicken. In a food processor add the scapes, cilantro, lemon zest and juice, crushed red pepper flakes and 2 tablespoons of olive oil. Puree until the ingredients form a paste. Whisk in 2 tablespoons of white wine vinegar. Reserve 3 tablespoons on the cilantro mixture. Place the chicken breasts in a shallow pan and pour the rest of the cilantro marinade over the chicken. Cover and refrigerate for at least 1 hour. Make the salad dressing by whisking in 2 tablespoons white wine vinegar and 2 tablespoons of olive oil to the reserved cilantro mixture. Set aside. Heat the grill and cook the marinated chicken breasts until completely cooked (internal temperature of 160 degrees Fahrenheit). Equally divide the chopped lettuce between two plates. 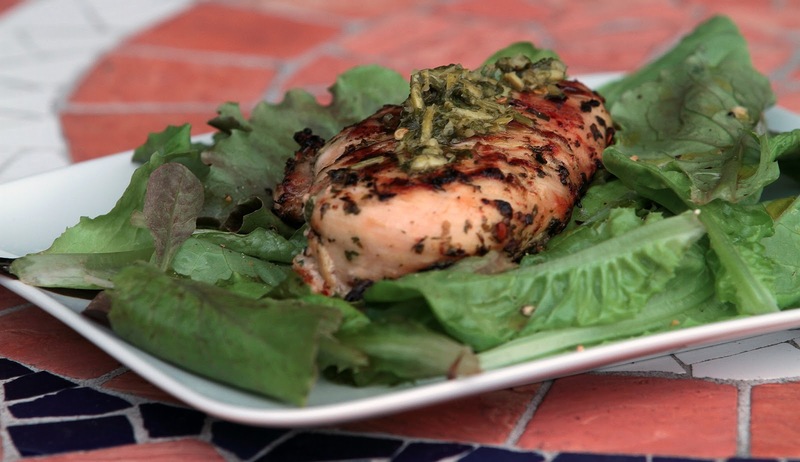 Place a cooked chicken breast on each plate atop the lettuce. Pour on the dressing. Serve warm or room temp. What are you making during these hot summer days?